Dark Horse presents some amazing vinyl figures based off of the popular Powers comic book series! 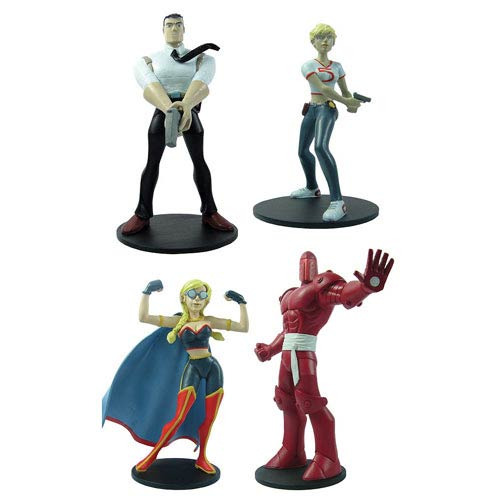 Creator-owned by the legendary Brian Michael Bendis and Michael Avon Oeming, Powers is a fantastically unique series, and the figures in this Powers Vinyl Figure 4-Pack Set show that individuality. The figures in this vinyl 4-pack measure between 4-inches and 5-inches tall with Walker and Pilgrim as centerpieces of the ensemble. Plus, Walker and Pilgrim are even joined by Retro Girl and Triphammer! Ages 14 and up.